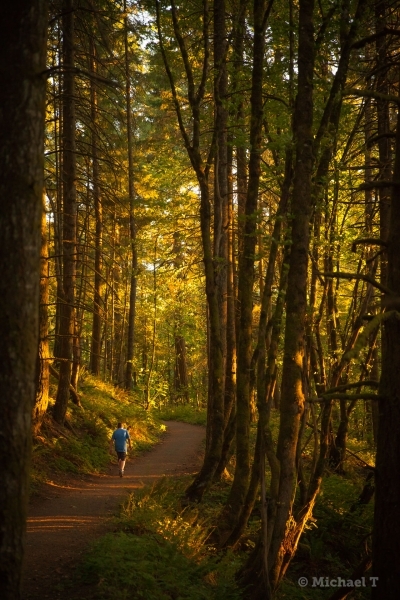 The 14 mile long Ridgeline Trail, meanders through over 1000 acres of diverse natural habitats straddling the southern edge of Eugene, Oregon- Access to the trail is easily found in many of the surrounding residential neighborhoods of south Eugene. The trail provides an extensive opportunity for recreation and nature appreciation just a few miles from downtown and within walking distance of thousands of residents. The Ridgeline Trail, especially the challenging spur which climbs to the top of Spencer Butte, is one of the most popular trails in the metropolitan area. 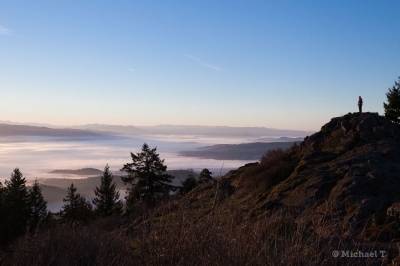 Spencer Butte, elevation 2054', is the highest and most prominent landmark at the southern end of the Willainette Valley. The trail and surrounding park have had broad public support ever since their origin in a 1939 grass-roots campaign which collected contributions no larger than $5 in order to let everyone "buy a piece" of the butte. 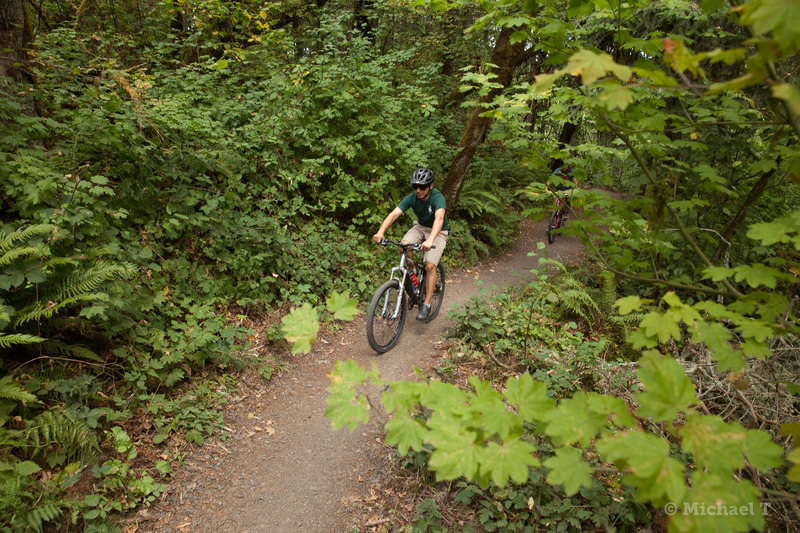 Since 1939, the City has continued to actively purchase adjacent lands and extend the trail, towards completing a vision of a twenty mile long wildlife, scenic, and recreational corridor connecting Fern Ridge Reservoir in the east to the Willamette River, and Mt. Pisgah in the west. 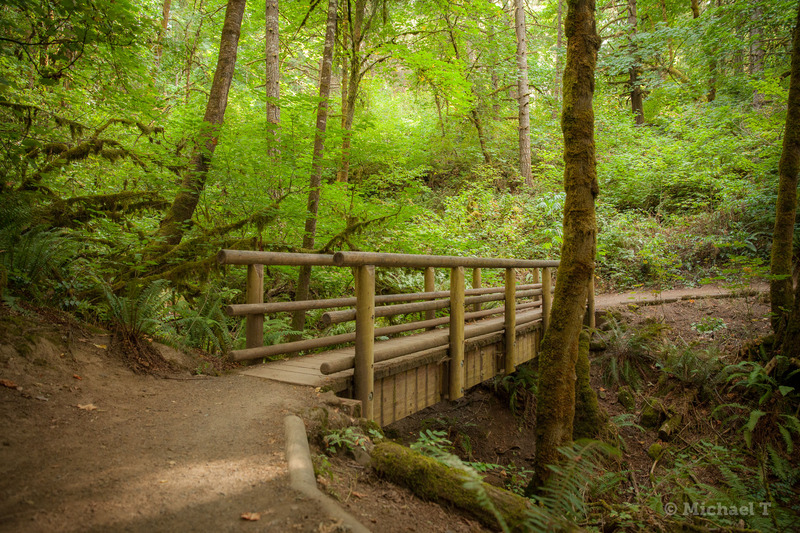 The City has partnered with a wide variety of organizations and agencies to help build and maintain the trail, manage the habitats, and acquire additional adjacent lands, including. Federal, State, and Local governments, conservation organizations, citizen groups, and educational institutions. 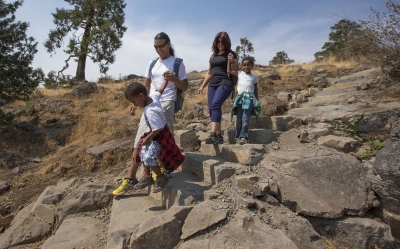 Hikers along the trail pass through a great diversity of habitats including: Old growth Douglas Fir forest, globally imperiled upland prairie and Oregon White Oak savanna, California Black Oak, Ponderosa Pine woodlands. Incense Cedar, Grand Fir, Bigleaf Maple, Black Cottonwood, Oregon Ash, and abundant native shrubs, wildflowers, and grasses. The top of Spencer Butte is a regionally unique rocky bald with rare lichen and bryophyte populations and affords outstanding views to the surrounding city, countryside, and distant mountain ranges. The trail includes several boardwalks and bridges and is a wonderful resource for bird and wildlife watchers. Portions of the trail are open to mountain bikers. 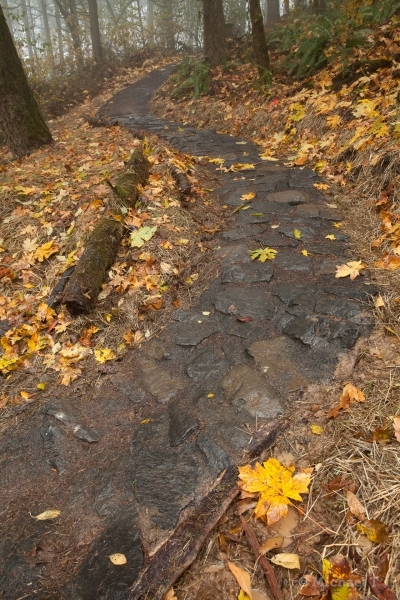 The primary surface of the trail is compacted gravel. A winter view from Spencer Butte. Winter solitude from the summit. 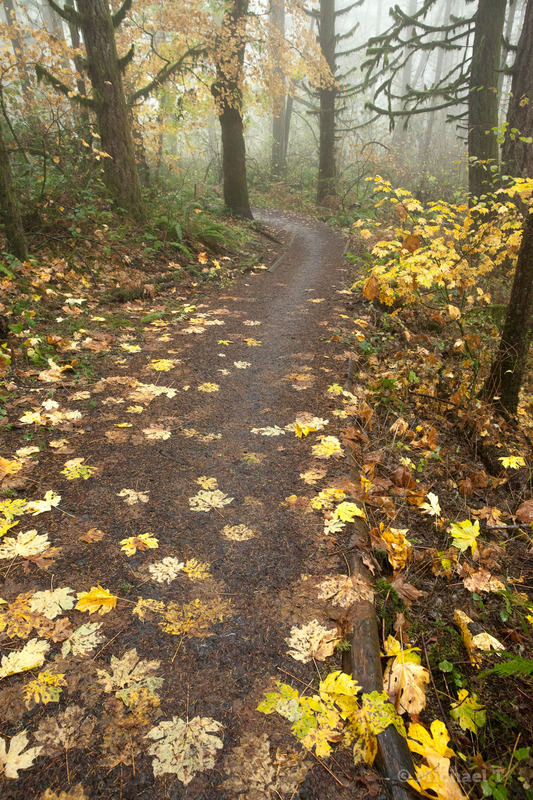 Big-leafed Maples and Vine Maple add color to a rainy day. Armoring was added to sharp curves to prevent erosion. 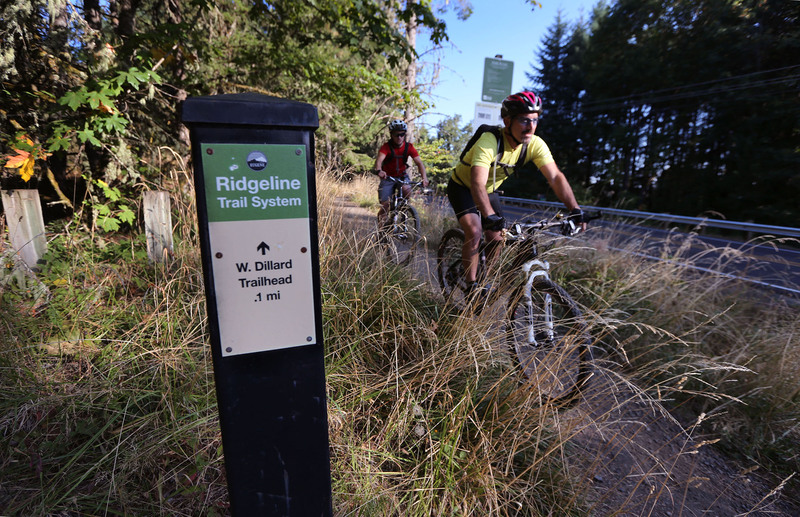 The Ridgeline Trail gives a dose of nature to tens of thousands each year. 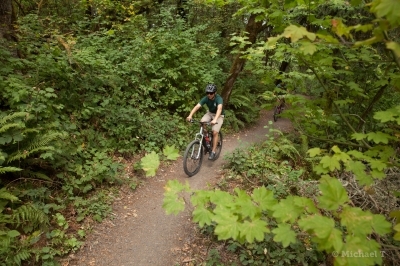 Sections of the trail are open to mountain bikes. 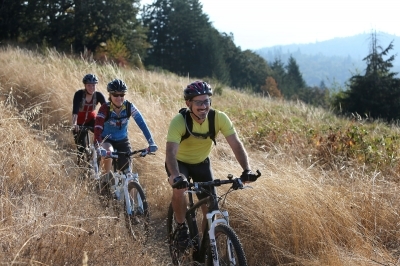 Bikers on the Ridgeline Trail in Eugene, Oregon. Photo by Chris Pietsch. 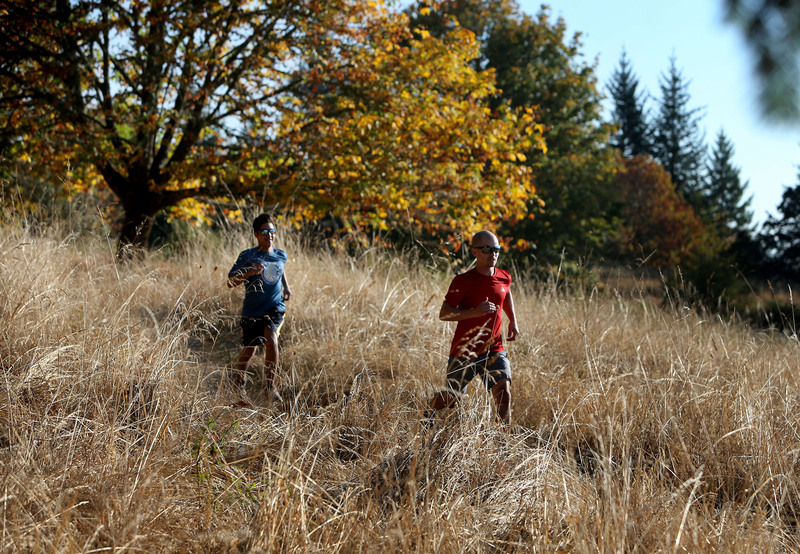 Runners take advantage of a sunny day on the Ridgeline Trail. Photo by Chris Pietsch. New stairs to the top of Spencer Butte make this section family friendly! Photo by Chris Pietsch. 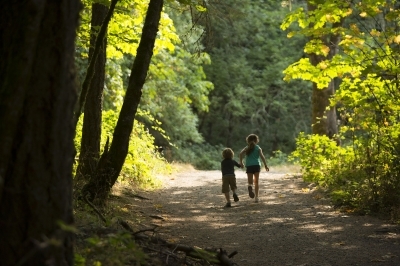 Kids running ahead on the trail. Photo by Chris Pietsch. 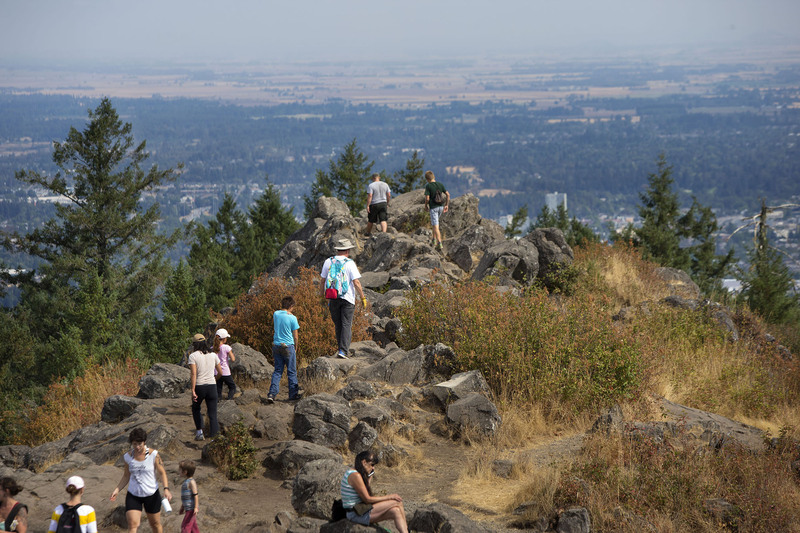 On a clear day you can see all of Eugene from the top of Spencer Butte. Photo by Chris Pietsch. The Ridgeline Trail offers a variety of difficulty in a forest setting just minutes from town. Trailheads can be reached from the local bus system. 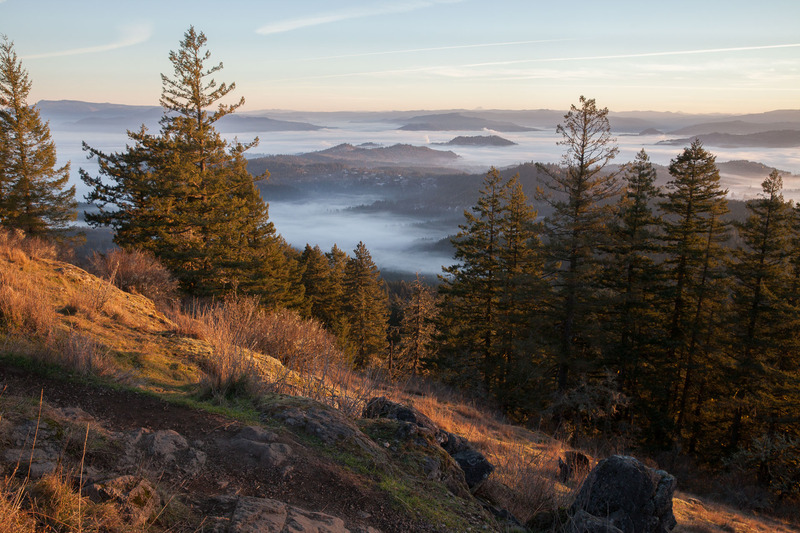 On weekends in summer it seems the entire community of Eugene has headed up Spencer's Butte, making parking and solitude something scarce. In fact, my only complaint of the trail is that the city has outgrown the parking provided. Still, a favorite trail in Eugene.